Home Feature Featured Outlook | A new monster? 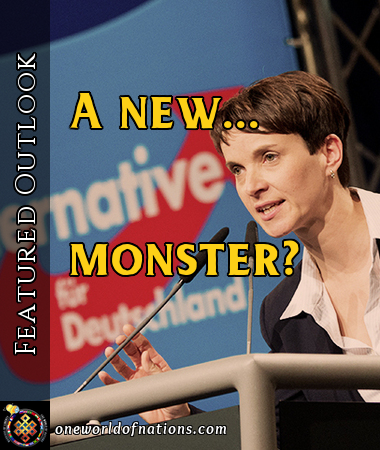 Featured Outlook | A new monster? OWON: History repeats itself. As the Cabal driven cesspool of the EU is rebounding with the mass population rejecting failed Leadership and being sick to the back teeth of this never ending chain of illegals, the Mother of all War Mongrel Nations is awakening again. Germany is not alone. Most EU nations want end to this unceasing human tide of Refugees, and will not tolerate much more Socialistic crap from its abysmal Leaders. Twice Germany took the EU to war. It has Form for it. Why not again? Be assured, this Right Wing lash-back is not unique to Germany. Cleansing the nations is in the hearts of most oppressed Europeans, and if the albeit Right, but WRONG Party accedes to power, what can go wrong, may well WILL. Hitler was just a product of his time. Social repression gave him a platform. The masses give him the power. Despised as "The Little Corporal" by the Intelligentsia, it mattered little at the ballot boxes. They wanted change, an end to restraint and the perception of the Jews, now a Jew / Islamic resentment is at large. The Mobs will bay for blood as the EU collapses, as with the French Revolution. They will need the scapegoat to name and blame. Little restrains the masses from the baying mobs possible if all fails. Civilization again hangs by a thread. Churchill warned about the Nazi menace and risk. He was ridiculed in the derision hurt. War followed worthless Leaders failed promises. Germany alone cannot carry the EU. A Socialist rabble led by Alcoholics, Welfare State morons and the Vatican. What pray can go wrong? When the UK leaves, and cuts its losses, what then? A Hard Brexit becomes ever more likely now. Still these Clowns in Brussels do not see it yet. Theresa May could be swept out of office any time. She clings to power by a thread. Tenuous times with no moral authority or power. Merkel is on a knife edge. As is the EU. A power key of anger is building and the illegals keep coming. Last time the British fought with Germany. Next time it may fight WITH! Sweeping all aside. Eurasia is coming and with it Ethnic cleansing. Again! The world is so at war. Why not Europe again? United by a common goal of clearing out the trash? Since when has morality ruled nations? To succeed, feed need, then watch the mobs greed. What is awakening again? Since when has a Leader been a model citizen? Not one in 50 years in America. Germany is stirring. Now the dust has settled after an extraordinary week in Germany, we can see that this country is setting a new and disturbing agenda. What other countries had nightmares about, Germany is doing. A bandwagon has begun to roll which could steamroller all Europe, in a disturbing echo of that country’s inglorious and deadly past. The Federal Election of 24th September saw both Angela Merkel’s CDU/CSU and the other traditional governing party, the social democrat SPD, perform very badly. Merkel’s union parties lost 65 seats, declining to 246, and the SPD lost 40, to leave it with 153, its worst total since World War Two. These parties were previously united in a Grand Coalition, a confession of failure in itself. The SPD now says it will go into opposition due to its much-reduced mandate and Merkel is trying to patch together a coalition with the traditionally SPD-aligned Greens and the liberal, pro-business FDP, which has supported both the big guns in the past, to remain in power. When a country has two big parties and they both decline in the same election, this is generally attributed to a protest vote. The FDP failed to make the 5% threshold for representation last time round, but now has 80 seats, having grabbed 10% support this time, almost regaining the historically high numbers it had after the 2009 election. But the big winner was the AfD, the nearest thing Germany has had to a Nazi party since the original version. It came from 4.7% to gain 12.6% of the vote and 94 seats, making it the third largest party. By comparison, the Nazis came from 2.6% of the vote in 1928 to 18.25%, and second place, in 1930, before taking power three years later. 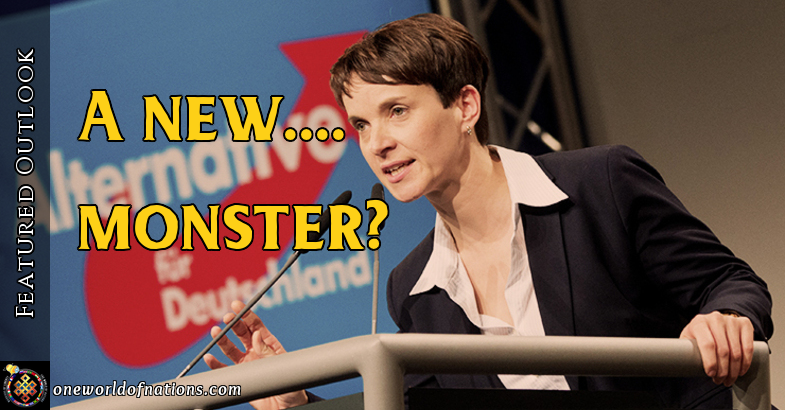 All over Europe, extreme right parties have become serious political forces. Like the AfD, they have an anti-immigrant, anti-Muslim and ultra-protectionist platform designed to “make their country great again”.